My mom truly spoiled my siblings and I with her delicious cooking. We always had some type of baked treat hanging around (who needs Oreo’s! ), a made-from-scratch dinner (though when I was the last child left a home we sometimes just had popcorn and ice cream for dinner but no complaints there! ), enjoyed a tasty breakfast like crepes even on a school day, and ALWAYS had a jar jars of homemade jam in the fridge and freezer. Throughout my entire life I have only bought a jar of jam once… and that was a big mistake. 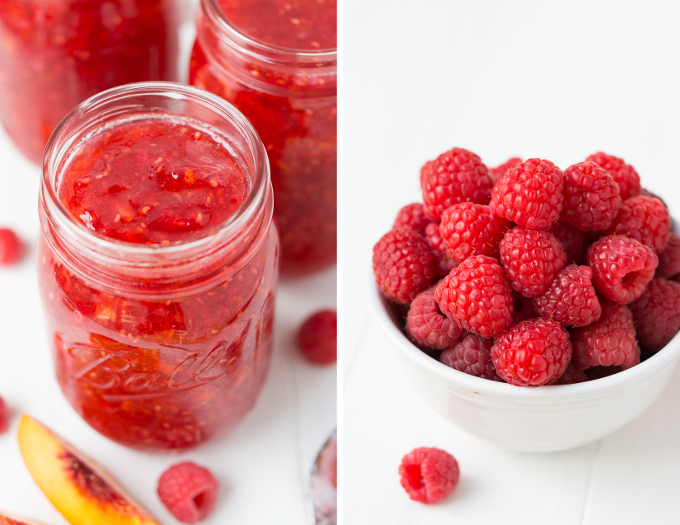 Once you try homemade freezer jam you will never go back to store bought. Seriously! So why is it so superior? 1) It’s homemade, aka- made with extra TLC. 2) It’s made with deliciously ripe fruit so it tastes A-mazing! (keep reading to see what I like to put it on) 3) When made with fruit that is in season it is very affordable. This batch of jam that yields four 1 pint jars cost me about $8. 4) You don’t have to know how to can or worry about killing your family with botulism. This liquid (semi-liquid?) gold is stored in the freezer. 5) It’s easy to make! Wash and mash up your fruit, add some pectin, give it a few stirs, add some sugar and heat it just enough so that the sugar dissolves. Pour it in your mason jars or Tupperware and freeze it… but keep one jar in the fridge of course for immediate use. 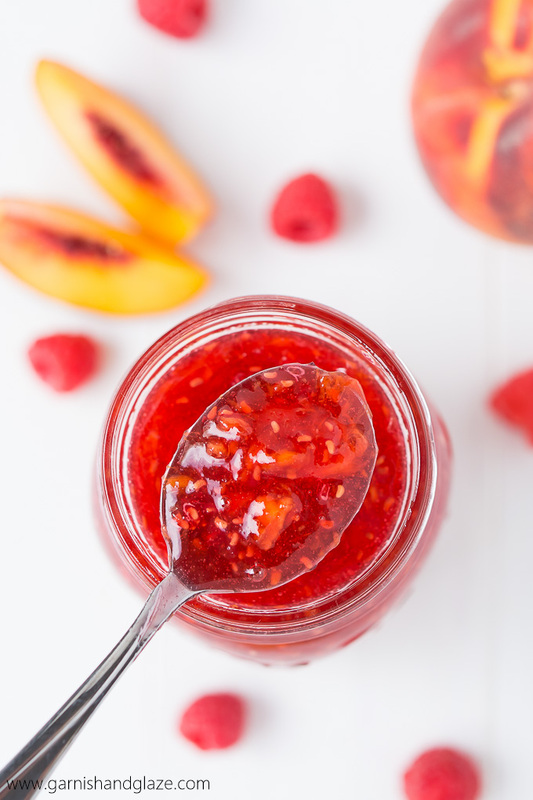 I’ve already shared with you a recipe for Strawberry Freezer Jam, Raspberry Freezer Jam, and Blackberry Jam, but this Raspberry Peach Freezer Jam is my absolute favorite! 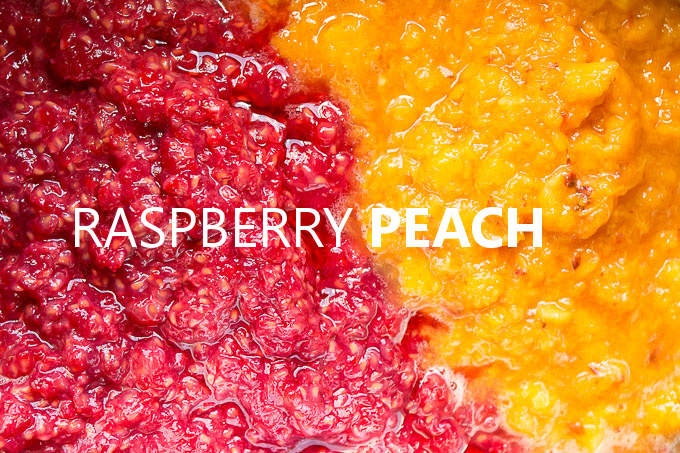 The combination of the strong raspberries and sweet peaches is amazing. It tastes awesome on a PB&J, rolls, bagels, toast,… really anything. 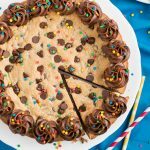 You can even use it in some recipes like this coffee cake or this Swiss Roll! It’s so good you’ll want to lick the spoon when you are done applying the jam to whatever it is you’re eating. Lately, Carly and I have been gulping this stuff down for breakfast on our toast with peanut butter. I recently discovered that it’s also yummy on a bagel with cream cheese. What is your favorite way to enjoy jam? Mash (with a potato masher or if you don't want any chunks you can use a blender) and measure your fruit (dip peaches in boiling water for about 45 seconds to make peeling easier). 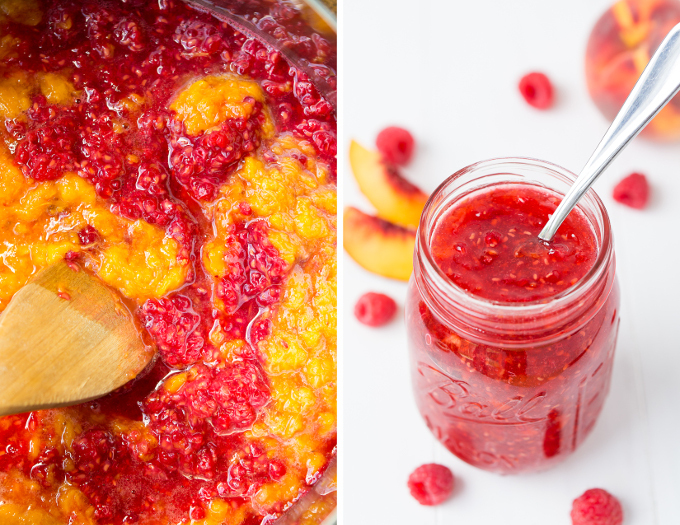 Mix raspberries and peaches together in a large pot. Sift in the pectin a little at a time while stirring. Once all the pectin is mixed in, set a timer for 30 minutes and give the fruit a stir every 7-10 minutes. After the 30 minutes, mix in the corn syrup and then place the pot on the stove over medium heat. Stir in the sugar a little at a time and cook for about 5 minutes until the sugar is dissolved (when jam reaches 100 degrees F). 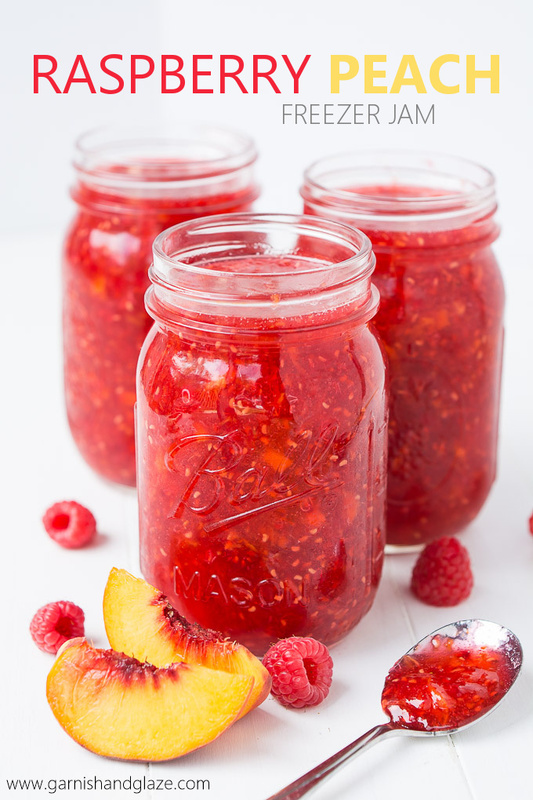 Pour jam into clean plastic containers or glass jars. Jam lasts 1-2 months in the fridge and up to 1 year in the freezer. Looks incredible! I’ve never tried freezer jam before. Sounds perfect for stocking up for the winter months! Mmm this sounds like my jam! Jade, if your jam came out runny it is because you cooked it too long. You barely heat it enough so that the sugar dissolves. It’s no hotter than baby’s milk, so like lukewarm. Another problem could be that your raspberries were still wet from washing them so more water was added? This jam isn’t as thick as store bought jelly (jello) though if that’s what you were expecting. I never ever wash raspberries!!! They have nothing on them except maybe a leaf or bug and you can pick those out!!! Wow I would just save that runny jam and put in smoothies, or put in milk. Just use it as a syrup for pancakes, icecream, etc. Use it as pancake/waffle syrup. 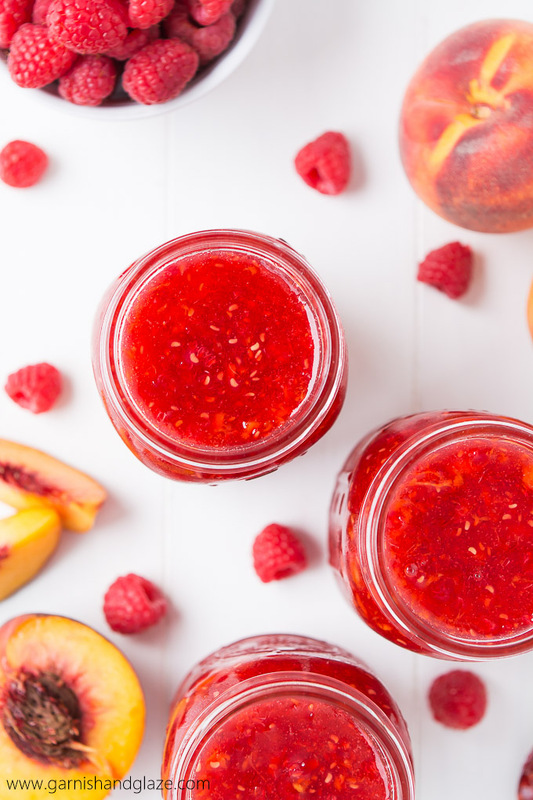 Don’t throw out “ruined” jam that is runny- just freeze or keep in fridge and use for glaze on meat, pancake syrup, or ice cream topping. use it for syrup on pancakes or waffles! I overheated mine as well but still taste great and a very happy with the flavor. Will follow recipe exactly next time to get a thicker outcome. Will make again soon. I just made this jam and it turned out great! It is a yummy fruit combo. Thanks! Is this powder form sure jell or liquid form? Powder. It comes in a small box like the size of a box of jello. Do you need to let this sit for 24 hours or anytime before freezing? No. You can stick it straight in your freezer or fridge. Can you do a water bath so it can be on a shelf instead of the freezer. 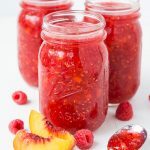 Jen, I haven’t tried that and have never done water bath canning so I’d just try to find a shelf stable raspberry jam recipe and swap out half of the raspberries for peaches. There are different sure jell packages. I use a pink one. What color is the one you use? The pink one is for if you are making No-Sugar jam/jelly. 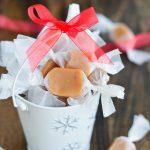 You need the original Sure Jell pectin that comes in the yellow package for this recipe. Please add me to your mailing list . Yes. It is pretty sweet. That’s jam for ya! So deliciously sweet! Made this ! even though its slightly runny it is so delicious!!!!!! So happy with the results! Charlie, Freezer jam isn’t as thick as cooked/canned jam which is probably what you’re used to. So glad you liked it though! Do you know how it would be without Corn syrup? We made 5 batches today. 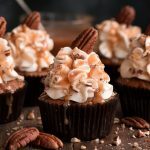 The consistency was perfect and the taste was amazing! This has become my new favorite raspberry jam recipe. Wow! That’s a ton of jam! I wish I had the freezer space for that much. I’m so glad you like it as much as I do! Bought the ingrediants today. 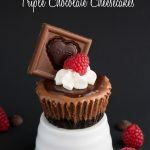 Gonna make this tomorrow! Sounds so yum! Thanks for sharing . I tried making this last night, and it turned out perfectly! Exactly the same consistency and look as your photos. And it tastes absolutely amazing! Thank you so much for posting this. After reading everyone’s comments I made slight changes. Pieces of fruit in it. Also, mash fruit 1st, then measure it exactly for the recipe. I also added 2 Level Tablespoons of Raspberry Jell-o, after I added the pectin. This gave additional flavor along with thickening it. So it wasn’t runny. Otherwise, I followed your recipe as you wrote it. We consider it a keeper recipe!!! Thank you!!! Can you use frozen peahes as they are out of season now? Bonnie, I haven’t ever used frozen or canned for this. As long as they you let them thaw and they taste good then I’d say go ahead and use them! I love the idea of freezer jams or even just fruits & veggies. Being new I dont want to spend a fortune on the huge pot & rack & all the things to go with it if I can just do a little cooking then pop it in the freezer. I would think even if it comes out runny it could be used for so many things. Toppings, shakes, ice cream, waffles, pancake. french toast, smoothies or even a glaze on some meats & veggies. Im going to pick blue berries & raspberries this wkend then a bit further north for strawberries. After the 1st of July Im going for Black berries. Cant wait. 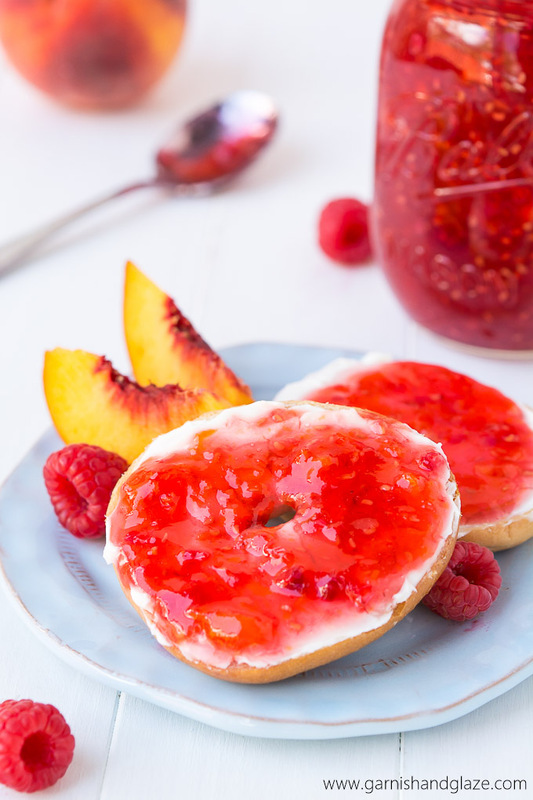 Melanie, this Raspberry Peach Freezer Jam is just gorgeous! Thank you for allowing me to feature it in my peach recipe round-up on my blog. I hope you have a great day!